Not sure it’s a sad day necessarily, but it’s the end of an era either way. 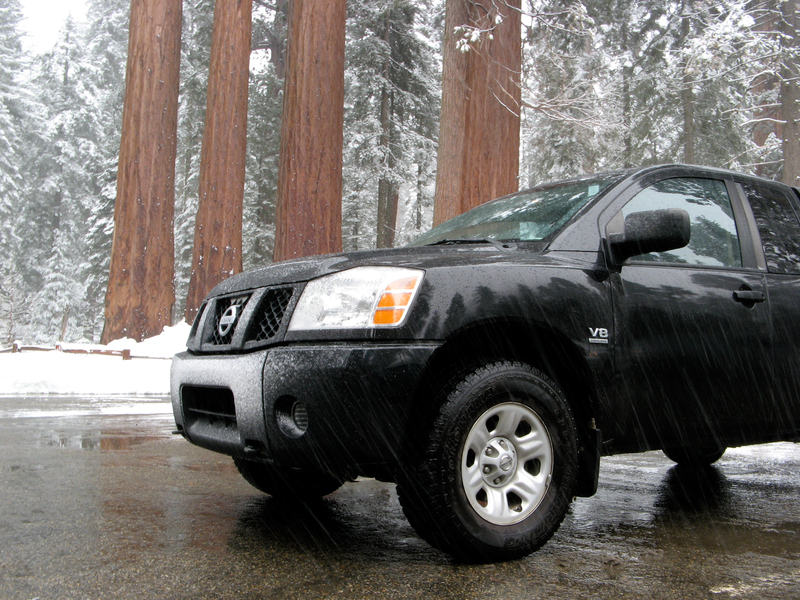 Sold my 2004 Nissan Titan. Had owned it for 12 years and it was a pretty vital part of my life for most of that time. 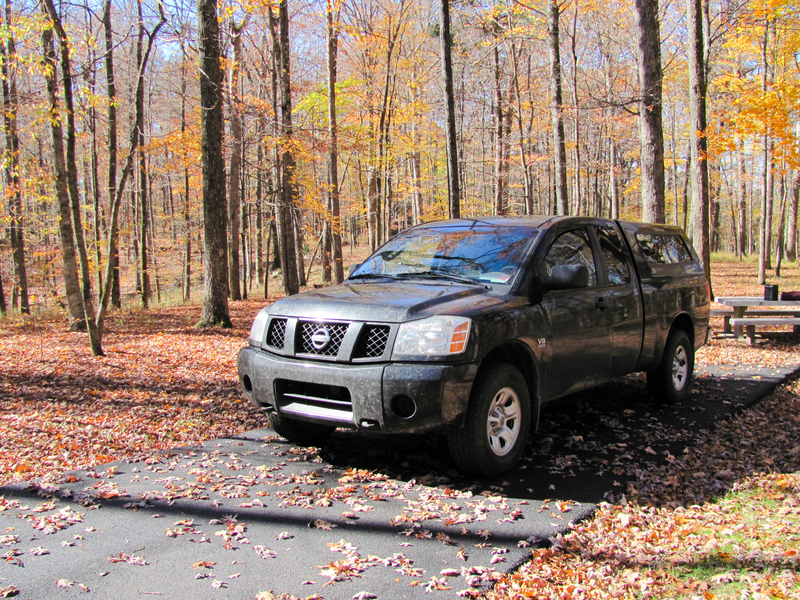 I bought the truck in June 2004, the first year the Nissan Titan was in production. It may well have been one of the first few thousand off the assembly line. The purchase was a culmination of many, many months of research. 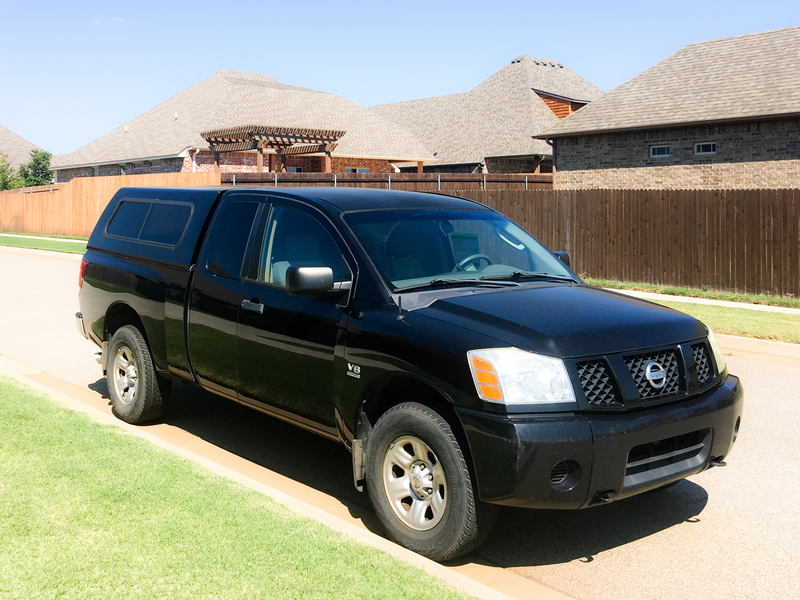 I ended up preferring the Titan due to (a) its handling and ride, (b) its engine and smooth power delivery, (c) it and the Toyota were the only full-size light-duty pickups being made in the USA (I was patriotic in 2004), and (d) its reasonable price. It replaced a 1999 Ford Mustang, which had become sub-optimal due mostly to my commute up to Long Beach from Mission Viejo at the time. It was about 40 mile daily commute through stop-and-go traffic and the Mustang had a manual transmission (I love manuals, unless I have to deal with rush hour traffic). It also tended to become invisible on the freeway, which led to frequent near-crushings. The XE trim was the base model. 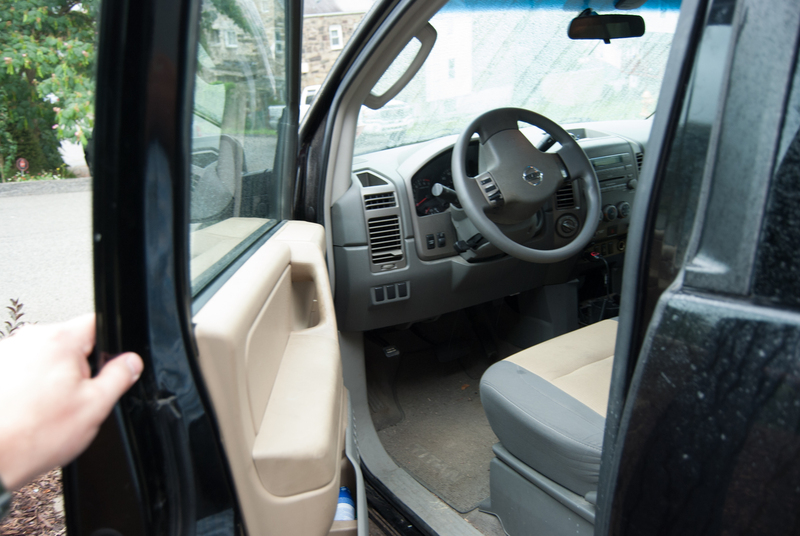 The truck has manual locks and roll-down windows. One great thing about roll-down windows is when you give someone a ride and they search all over the door trying to figure out how to put the window down. 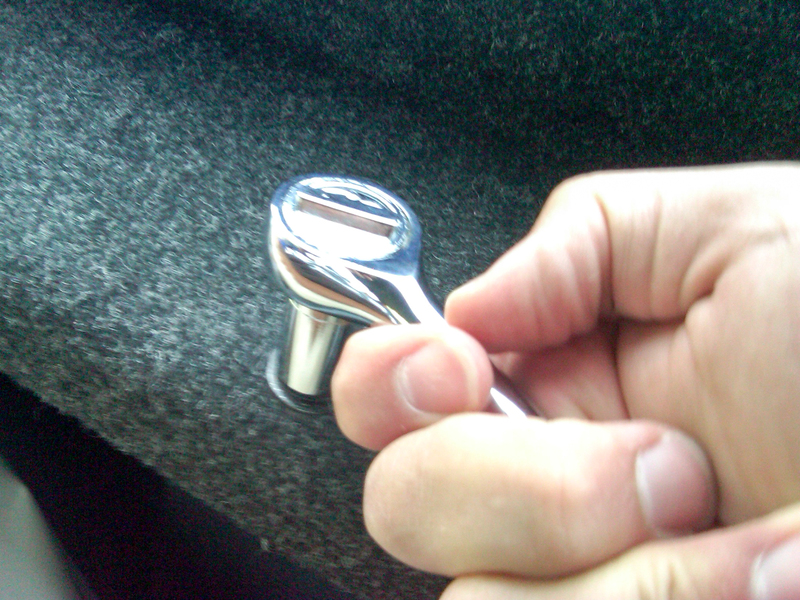 One bad thing about manual locks is that passengers take for granted that you have power locks and so the truck ended up being half-unlocked most times I drove with a passenger somewhere and then parked. So new it doesn’t even have plates yet. For its shake-down run, we went out to — southern Utah somewhere (apparently). Heck, we might have made it into central Utah and this might have been the trip when I was looking at houses in Lehi. I can’t remember. It’s been 12 years. Anyway, it took me up to Long Beach and back for several months, got me to adult-league baseball games (and was a lot better at carrying all the team gear than the Mustang had been), and sounded/felt great any time you would turn the engine over or, once going, floored the accelerator. 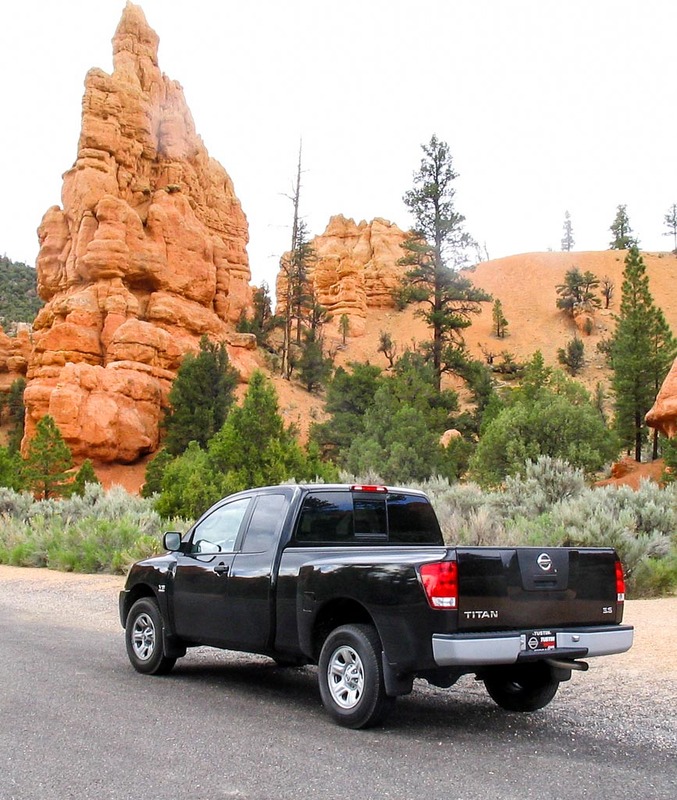 In the summer, we moved to Lehi, Utah, the Titan having acquired a trailer hitch and pulling a 6×8 from Mission Viejo to the 15 and then all the way into Utah County. The truck had plenty of room in the garage there and was a good helper in picking up materials from the Home Depot and hauling them back home to fuel the construction of the home theater I had in the basement. We took at least a couple trips up to the slopes and one memorable one down to Zion, where the brothers and I hiked down the Narrows for the first time. 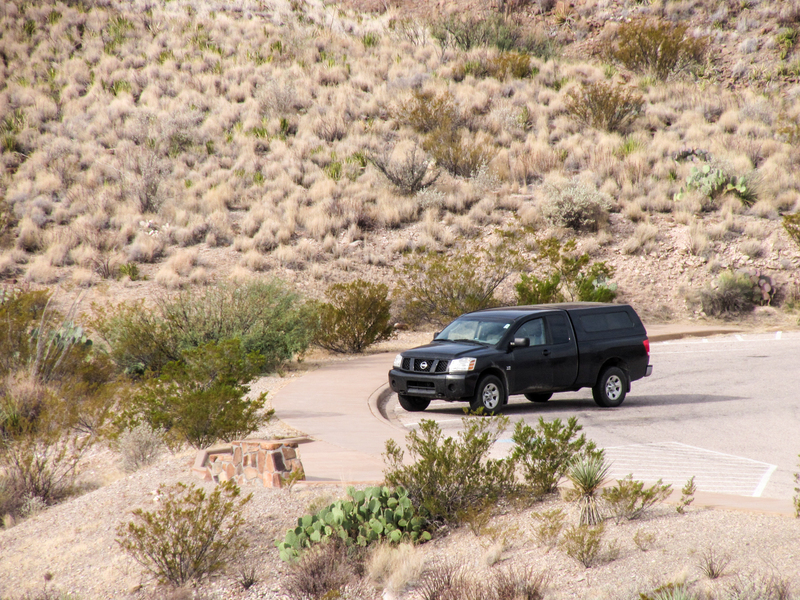 The Titan was the car we left at the top of the trail. Three people in this photo are now married. 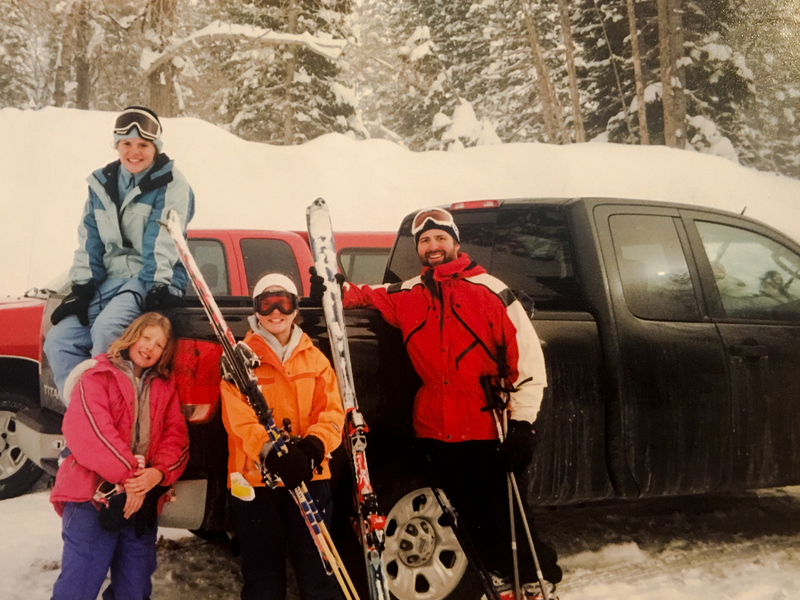 Later that year, I moved to New York City, leaving the truck behind in Utah where I hoped to sell it with Terry Brown’s help. 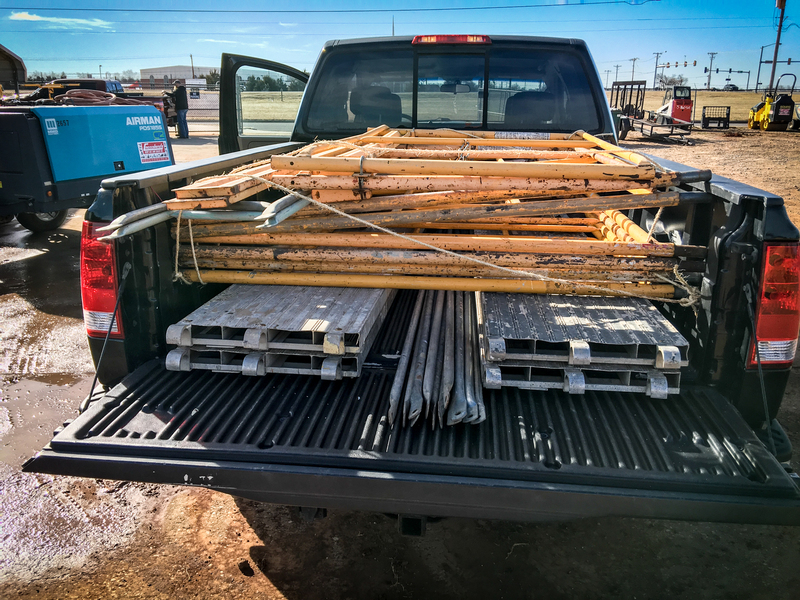 Got a couple offers, even accepted one of them, but the would-be purchaser changed his mind and the truck remained unsold. I might have priced it a little high for it to move. Maybe I didn’t actually want to sell it. After a few months in NYC, I decided I might as well go get it and bring it back east. Flew to Utah, picked up the truck, started driving. My mom came with me on the trip, which was an efficient one (i.e., we didn’t do any sight-seeing — unless you count looking at the hills and valleys of central PA while stuck in horrendous traffic). It ended on a Sunday night in lower Manhattan and, absent other ideas as to what to do with it in that moment, I ended up parking it in a lot there for $80 for the night. Next day I found a parking lot across the river in Jersey City for $125 a month, and that parking lot became the Titan’s home for the rest of my New York stay. During that time, I’d take the PATH train out to Jersey City to visit it on the weekends. We’d sometimes go on road trips — Long Island, the Catskills, and a couple to DC among them. Also during that time, I found odd pleasure in driving through (lower) Manhattan. From the driver’s perspective, all the seeming chaos of the taxis and pedestrians acquired an order; you could actually get to places in a motor vehicle in reasonable amounts of time and without killing anyone. Every time I needed to, I was able to feel my way effectively to the Holland Tunnel entrance that would take us back to Jersey City, where I’d drop off the Titan, then head to Grove Street to catch the train heading under the river and back to my apartment south of Wall Street. By 2006, it had become evident that New York/New Jersey was not our permanent home. I got offered a job back in SoCal, so it was time to pack up all 360 s.f. of my NYC belongings. In a scene that I, prior to living there, wouldn’t have guessed was a thing in Manhattan, I pulled the Titan up onto the sidewalk in front of my (16-story) apartment building and started making runs up and down the elevators to load it on up. The truck was parked out there for over an hour, no one said a disparaging word (loud enough for me to hear) and no cops came to investigate. Loaded up and cinched down, we rolled out of NYC heading first to Michigan for a writers’ workshop. Some hotel along the way. 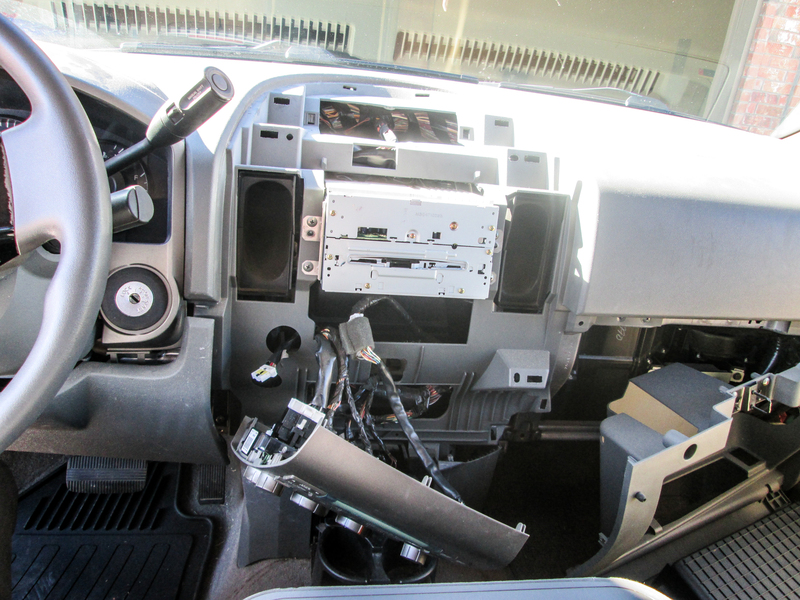 While parked overnight on Michigan State’s campus, someone broke out the back window (the most expensive one to replace) and found and stole my iPod. Thanks, Sparty. 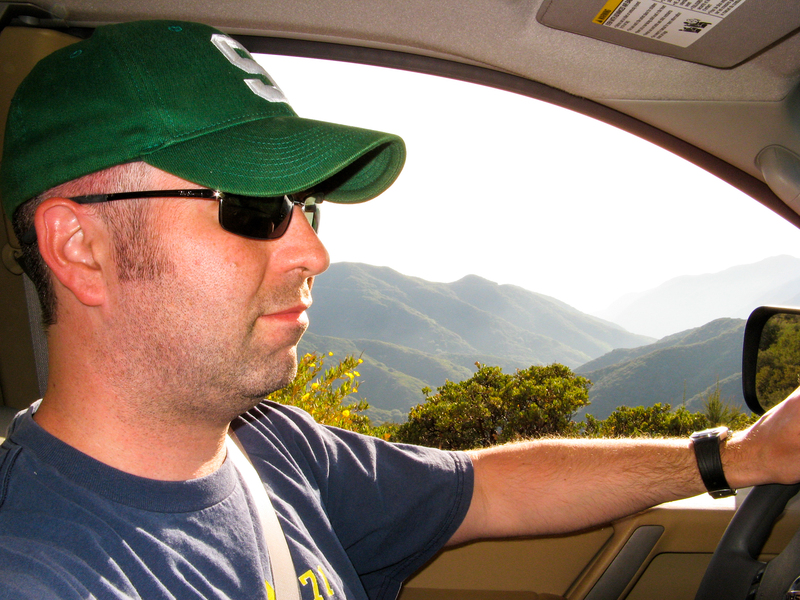 Once arrived in California, we went back to commuting, first from Foothill Ranch, then later from Mission Viejo (to the part of Irvine that seems like it should be Lake Forest instead of Irvine). On my first morning waking up at the condo I was renting and after getting ready for work, I went outside and discovered that the Titan was missing. Turned out someone had towed it because my landlord had given me the wrong parking space number. Other than that, though, the rest of ’06 was relatively drama- and adventure-free. Not much happened. We spent most of our time between my rented condo on Lake Mission Viejo and the parking lot at Toshiba five miles away. 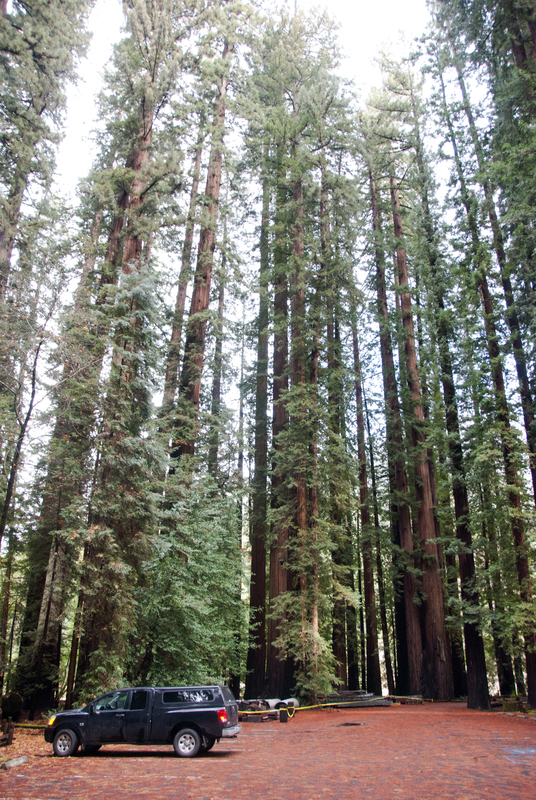 After exploring, I determined with some amount of certainty that there just wasn’t all that much worth seeing in the Orange County wilderness, although the fact that you could drive to the top of those mountains there may have suggested as much. 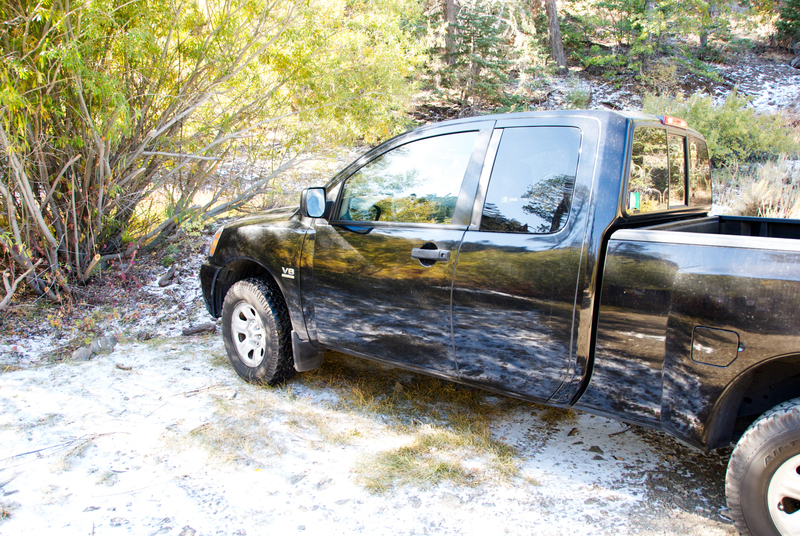 The truck was more than capable of tackling the dirt road to the Holy Jim Falls trailhead. 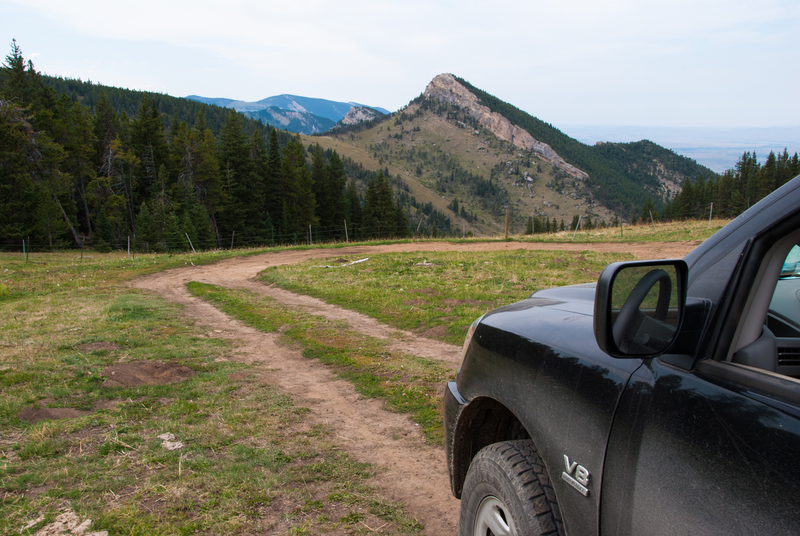 One time when I drove up there, I got stuck behind a mid-size SUV and was very frustrated at how slowly the SUV was going, despite purportedly having offroad capabilities. When the SUV and I got to the trailhead parking lot, it turned out that the driver was a friend of mine from UCI MBA days. Haven’t heard from him since then. Perhaps I was too animated during the chase. Round about 2008, having been to the Solomon Islands and finding them wanting (it turns out “tourist infrastructure” is sometimes useful), I resolved to spend my free time in the good ol’ American outdoors. 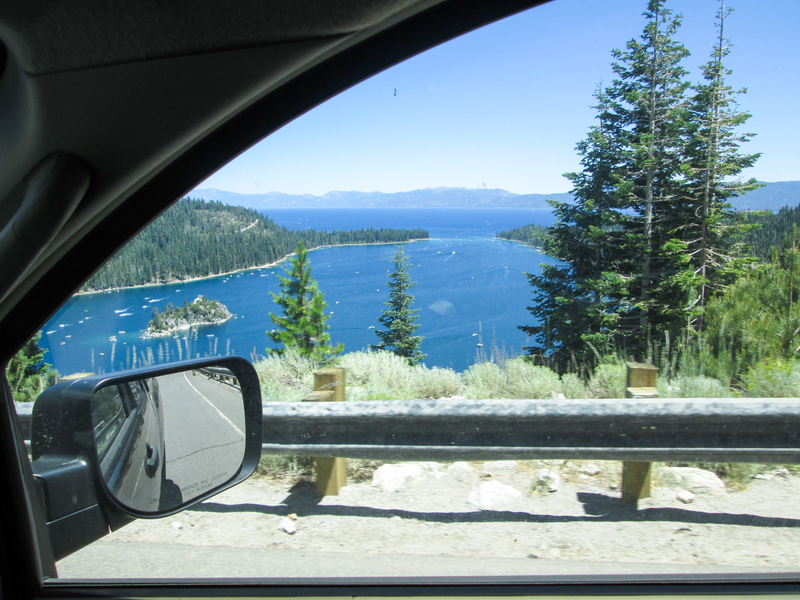 So we started packing up and heading to the mountains, taking a couple trips out to the California high and low countries (Big Bear Lake, Death Valley). 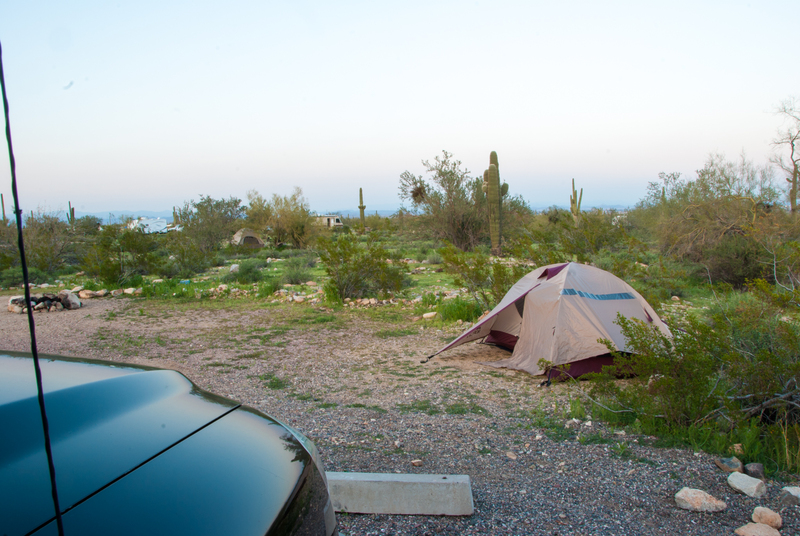 Camping in the valley of death. , when I drove out to some weird place in Fountain Valley maybe? 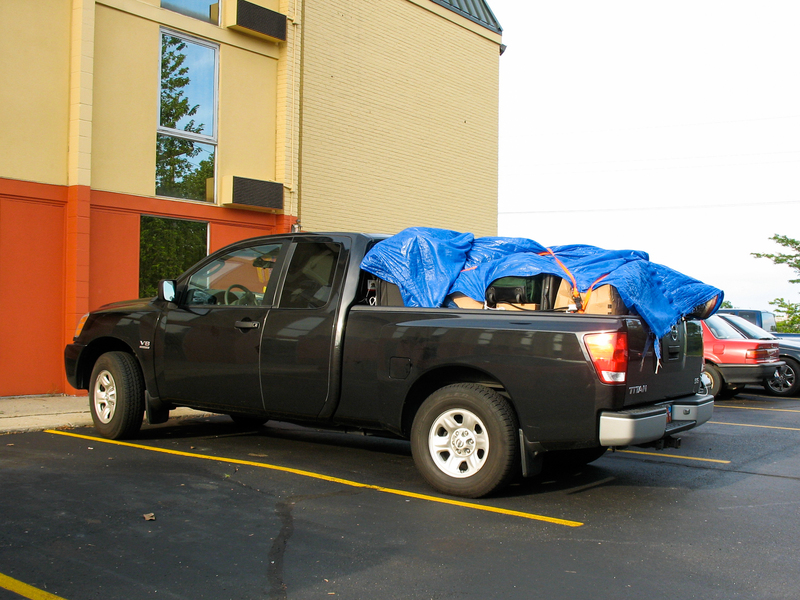 and extended the truck’s capabilities with a canopy shell. I also started getting this idea that maybe I didn’t want to work at Toshiba any more. (In truth, the idea first occurred to me in 2006 — the narrative is just clearer this way.) 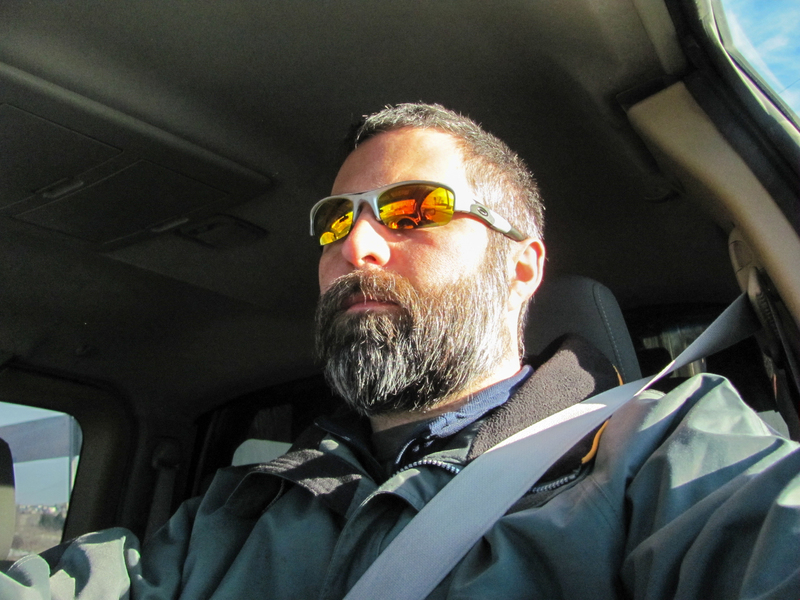 I started making plans to (a) do something different with my life (this turned into the academia plan) and (b) live in my truck for a long time. So I suggested to my boss that if I didn’t get promoted to a director title, I would probably quit some time that summer (Part A). We moved out of the condo to start conserving money, taking trip-after-trip to the storage unit down on Trabuco Road in Lake Forest before finding and renting the room at Sad Jeff’s house. 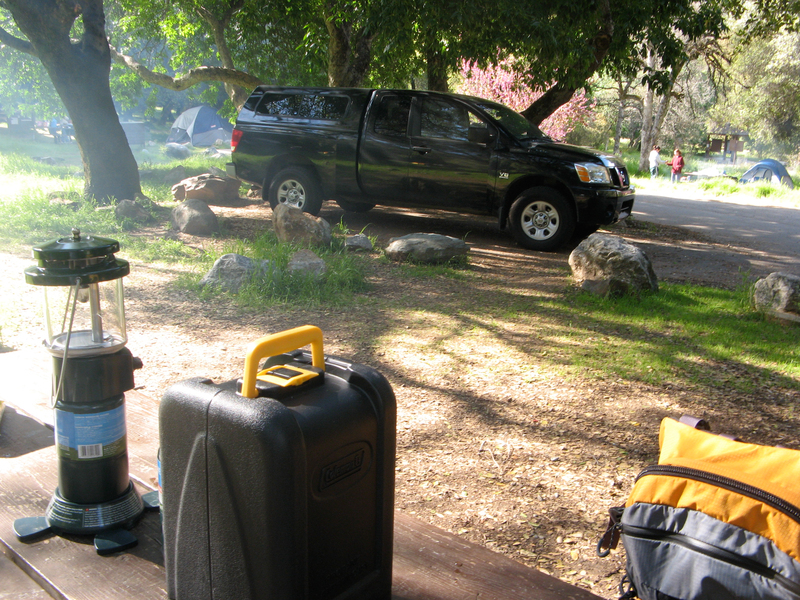 For Part B, we did a several-day proof-of-concept run to Sequoia and Kings Canyon National Parks. I think I probably had the cot already set up in the bed, though I don’t think I had the curtains on the windows yet. But anyway: evidence of conceptual validity was established. 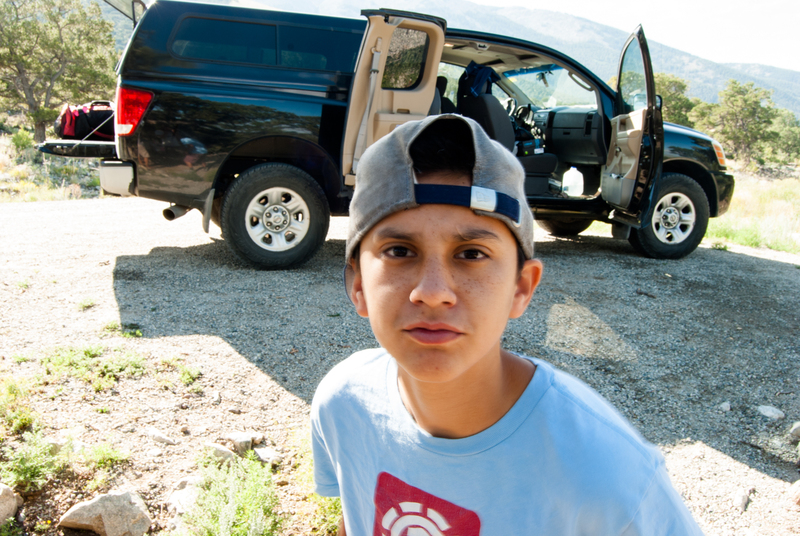 First-ever photo with the camper shell. And that yellow backpack isn’t quite so bright in color any more. It snowed in King’s Canyon. Shockingly, given how good I am at standardized tests, I did not get promoted. So I eventually gave four-weeks notice that I’d be leaving my post as of the end of June. Having already moved out of Sad Jeff’s house (it turned out he didn’t own it; that was a funny conversation) and temporarily into a granny flat in Laguna Beach across from Robert Englund’s house, we took the last of my non-trekking gear into storage, loaded up, and headed out for the open road. The road trip was, as if it could’ve been otherwise, the zenith of our time together. Not sure if the nephews gave me Donatello because they thought he and I would get along particularly well or if they just had an extra Donatello. 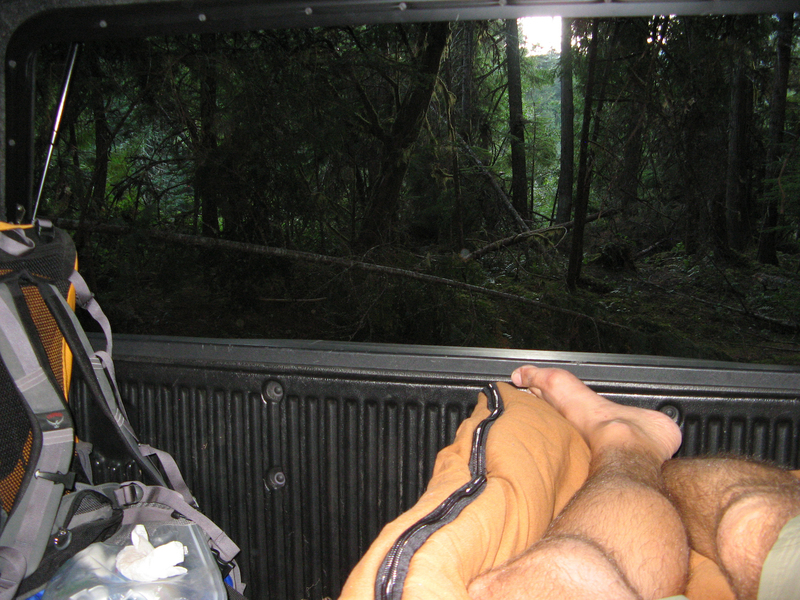 Back of the truck was functional living quarters (see videos below) and the views were often-enough pretty nice. 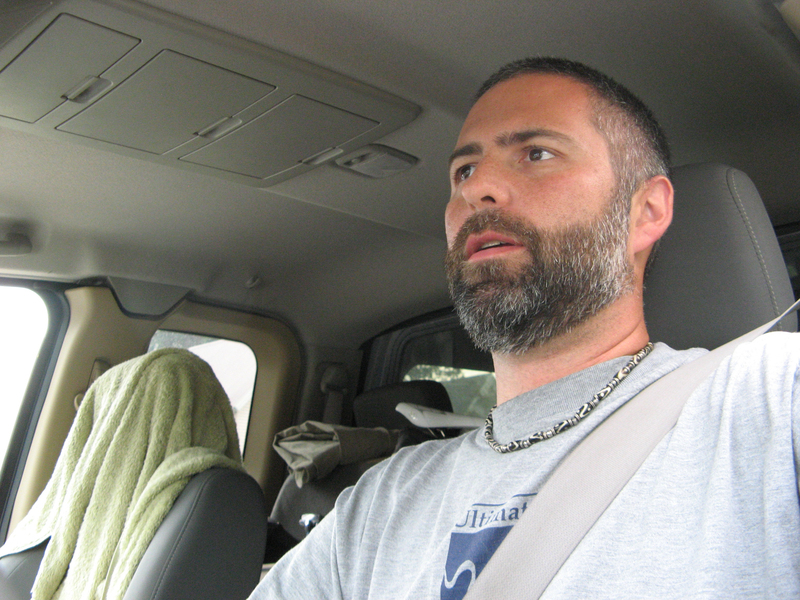 After a couple of days on the road, I was sleeping deep and hard, despite sleeping on a cot in the back of a pickup truck. I took way more stuff than I needed (the Xbox was kind of a silly idea and I never really used the portable generator — except the one night where I decided I should play the Xbox, just to do it, and therefore used both the Xbox and the generator). OTOH, if a Halo party had erupted in the campground, I would’ve been ready. View window near Mt. Rainier. Heading north on I-5, we hit a bit of a low point. Without warning, the transmission snapped into permanent-neutral in heavy-ish traffic near Olympia. We had enough momentum (and clear space right of us) to get to the shoulder. We waited about a half-hour for the AAA-sent tow truck to pick us up and give us a lift to an AAMCO up in Auburn. It couldn’t really have happened in a better place/time. We were on our way to my parents’ house for a family reunion, which was going to last a week anyway (surely that should be enough time to rebuild a transmission…). Anyway, after the reunion and a few bonus days in Tacoma, we sped back onto the freeway of life. 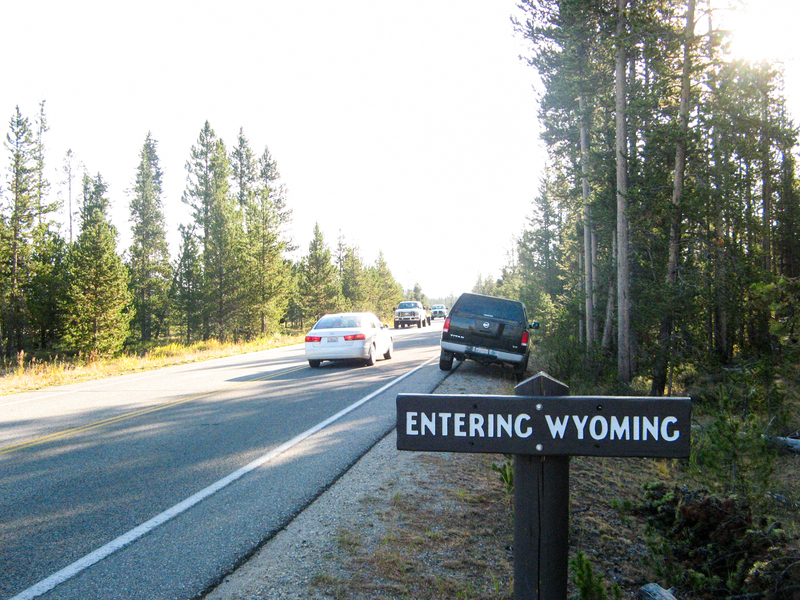 Wyoming was one of the 48 states we visited on the trip. Red Grade Road near Sheridan, Wyo. We didn’t cruise that many dirt roads on the trip — at least, not many that couldn’t have been handled by any two-wheel drive sub-compact. OTOH, having a house with wheels on it was great, and the truck was a willing draft animal. 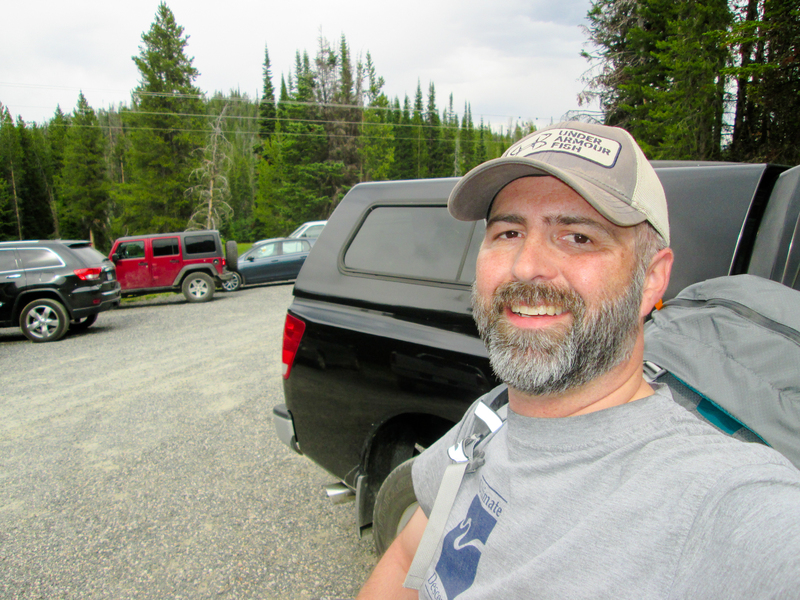 At the trailhead for Boundary Waters, about to head out to Nina Moose River. Cruising across upstate New York. Somewhere in North Carolina the canopy started slipping. I fixed it in a hotel parking lot. Parked on the Natchez Trace Parkway. 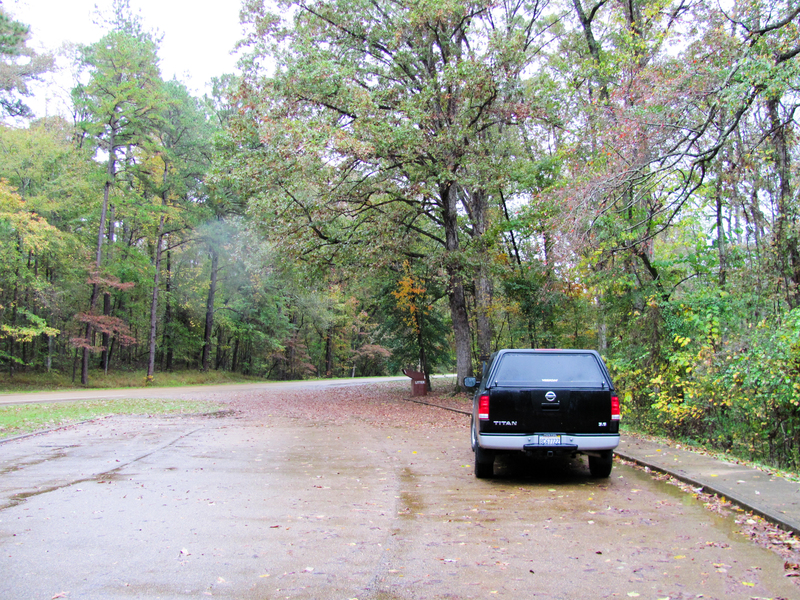 Our fall campsite in Mammoth Cave National Park. Decidedly dry Texas, Big Bend National Park (don’t go, it’s boring and way out of the way). Posed for the camera, Escalante National Monument. Come November, the nights were getting colder (read: cold) and, well, eventually all road trips must end. We covered the last leg from Utah down to my brother’s house in San Diego, then (I think?) started unloading the storage unit and hauling it down to my brother’s garage in East County. I sold some things during that time. I submitted a number of PhD applications. I planned, schemed. I also missed my road trip, which is a pretty intangible thing to miss. At Christmas, given that I didn’t have an actual job or anything, we took a trip up to Tacoma by way of everywhere possible that I hadn’t seen on the trip (and that was along the way): northern California coast, Redwoods National Park, the Evergreen Air and Space Museum in McMinnville, and Olympic National Park (again). It was a good run, a good cool down to help dampen the anti-climax that seemed unwilling to resolve itself post-trip. Early 2010, I received acceptances and decided I would enroll in the Information Systems PhD program at the University of Pittsburgh. To celebrate, we drove out to Arizona in March for some Spring Training baseball. For some reason I reverted to tent use. Also, having visited Pittsburgh, it occurred to me that a truck just wouldn’t fit there. The roads were too narrow. Parking was tight. Operating the truck was relatively expensive (17 mpg!). I started thinking that, for the four-to-five years I’d spend in the ‘Burgh, it would make sense to instead have a different car. I scouted around, found that all used cars were super-expensive, and then ended up getting a deal on one of Frank Freitas’s 2001 Priuses ($4,250?). 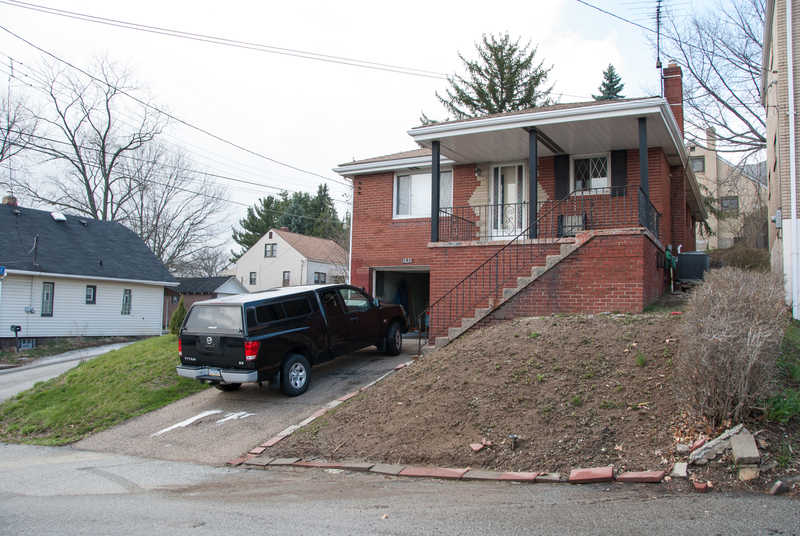 Then I flew out to Pittsburgh, looked for houses, and made an offer on a fixer in Lincoln Place, bought the house. I created a Gantt chart for the project of renovating my home-to-be, and it became clear that the truck would need to stick around. I’d need it to pick up building materials, but based on the plan, the renovation would be done by the end of summer, so I could sell the Titan then and revert back to a one-car normalcy. Meantime, I needed to move. Rented the oldest, most decrepit U-Haul 5×8 I could find and packed up. 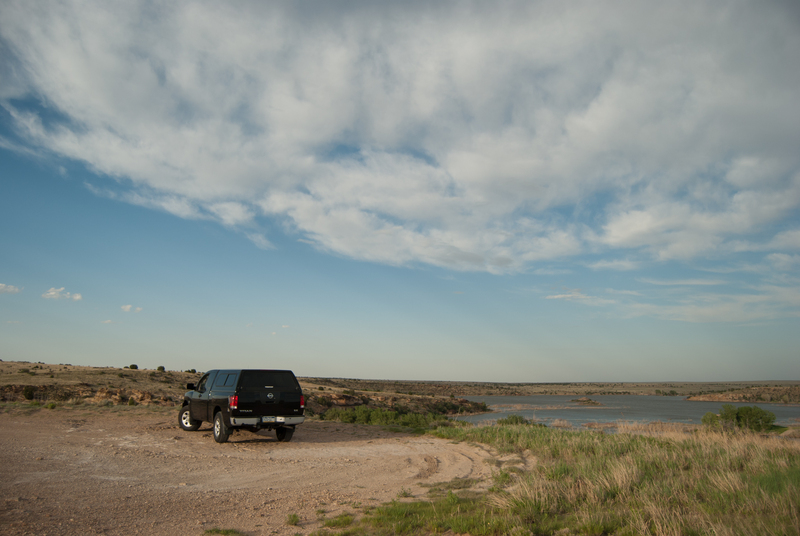 We took a direct route east, with a few scenic diversions through northern Arizona and Dodge City, Kan. (!). 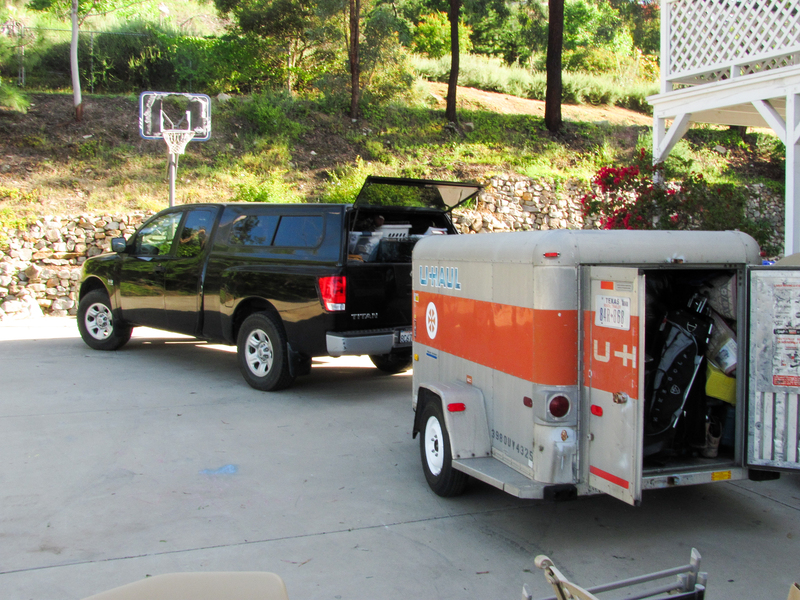 The truck got better freeway gas mileage *with* the trailer than it did without. After four days driving, I pulled up into the driveway of my awesome new home. The yard had looked a little less jungle-like when I saw it in March. We unloaded, returned the U-Haul, and got to work. Hauled rental equipment from the Home Depot in Monroeville, picked up DIY kitchen cabinets from the IKEA warehouse up in Cranberry, loaded up boxes full of slate tile, glass tile, ceramic tile, and paint. On a good day, we managed to get it all done in one trip. On bad days, we were in the Home Depot parking lot on three different occasions. My parents kindly drove the Prius to me from California and pitched in with a lot of scraping and building. After all that hard work and just before the start of the semester, the project was… nowhere near done. House still needed paint everywhere. The upstairs bathroom still didn’t work. Electricity worked sporadically. Basement had become a home for dead crickets. 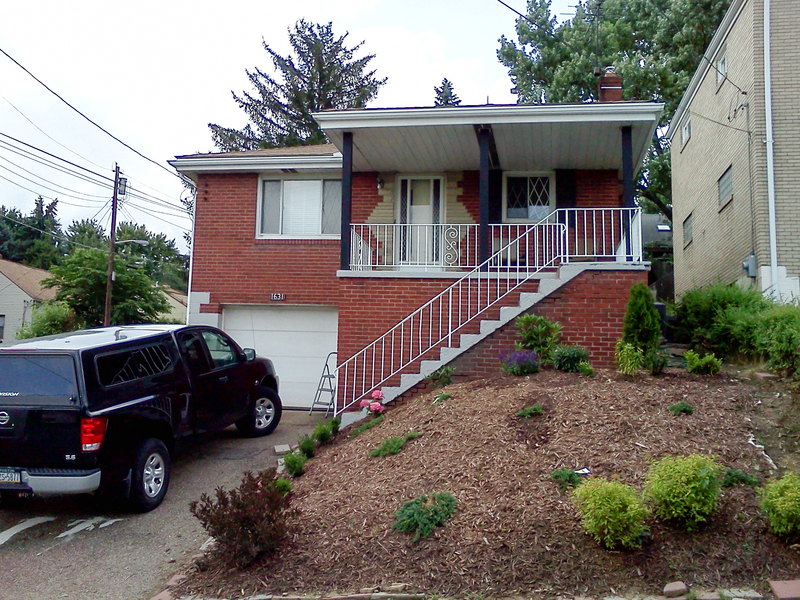 In 2011, we explored Pittsburgh and western PA, the house acquired a functioning upstairs bathroom and a new master closet, landscaping was landscaped and mulch was mulched. Most days consisted of driving from Lincoln Place into Oakland to park down in the ditch (er, “Panther Hollow”) before hiking up to campus. 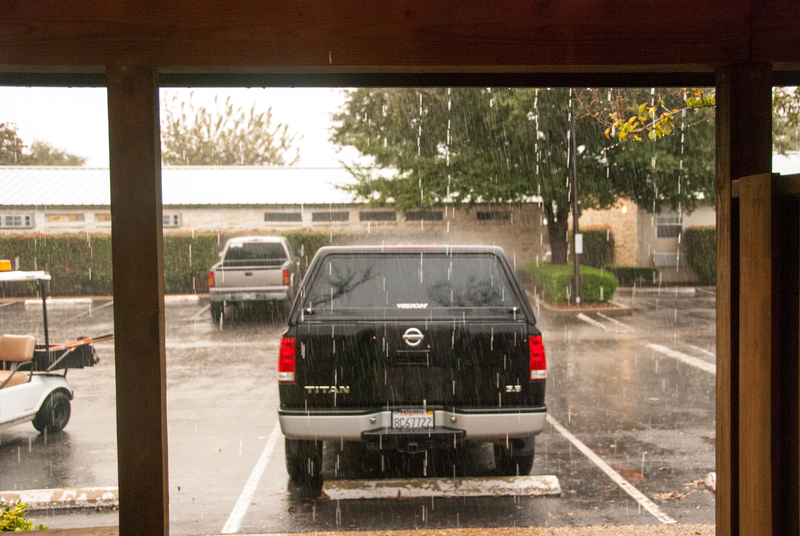 This was before I found out I could park at the church and walk a mile through the rain and sleet for free. I sort of took up skiing again. En route to discovering Seven Springs. I paid people to clean up the yard so I could start doing stuff to it. 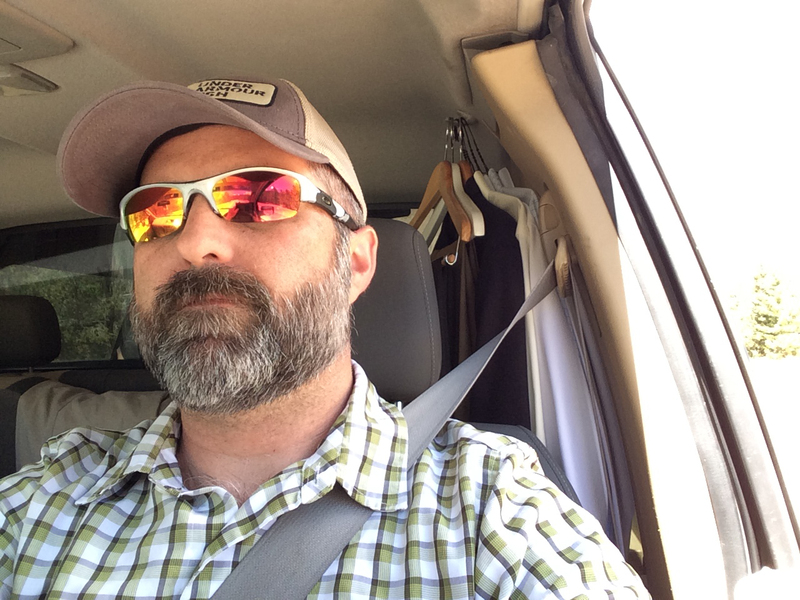 In the spring, having withstood two semesters of PhD coursework, much of it painful (not physically), I still yearned to get back in the truck and onto the open road. Loaded up, curtains re-hung, we headed on out and were going out west. 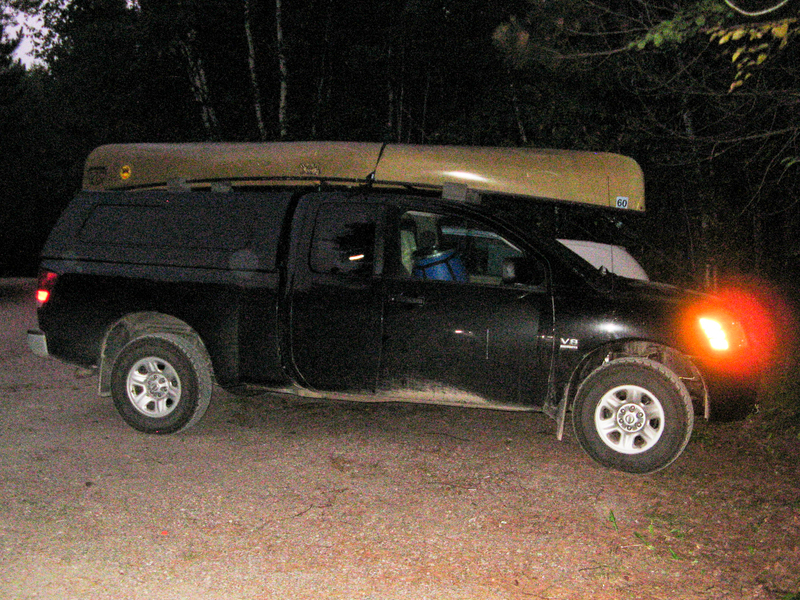 The truck performed beautifully, but the trip itself didn’t have quite the same magic as ’09. Still: Chicago to see Craig, passed through Spearfish and Garry’s house, went to Little Bighorn and passed through an amazing thunderstorm alongside the airport in Great Falls. Visited Waterton Lakes on the other side of the border from Glacier National Park, saw the house in Cardston, Alberta where my grandpa was born, visited Banff, Jasper, Kootenay, and Yoho National Parks and Mt. Robson in British Columbia. 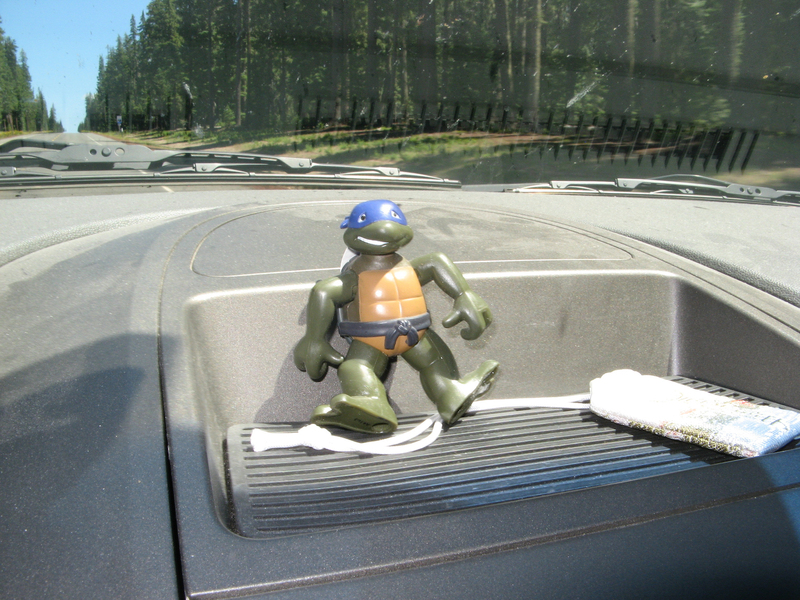 Headed down to Tacoma, then we headed east to the Montana Beartooths, eventually met Garry there and went up some savage washboards to the Glacier Lake trailhead. Fly fishing the Beartooths was pretty amazing. 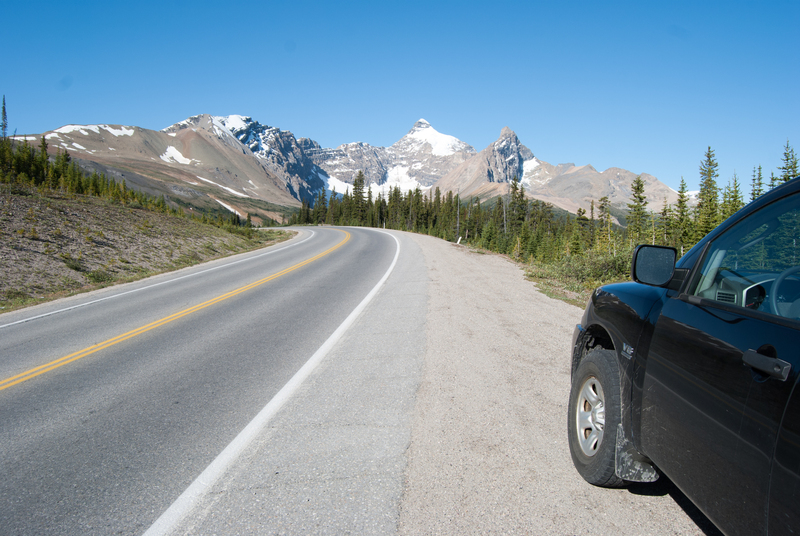 Banff: greatest drive-up scenery in the world. 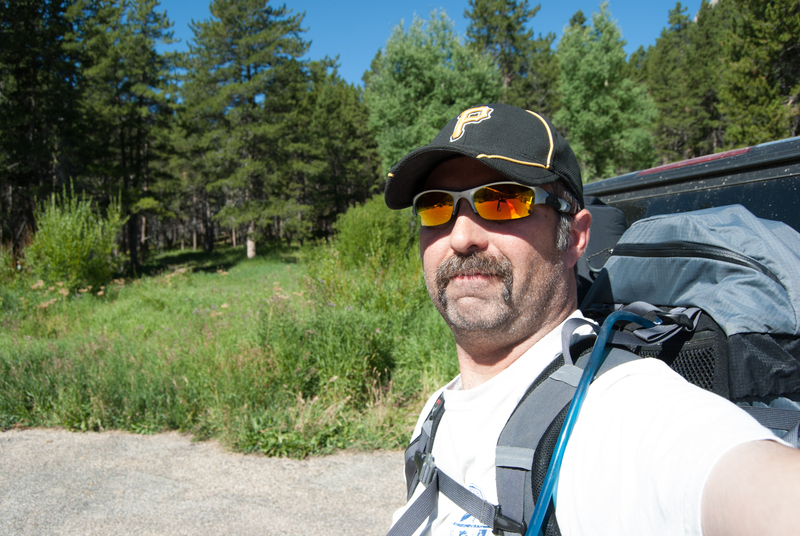 Parked at the trailhead on the way out to Keyser Brown Lake. 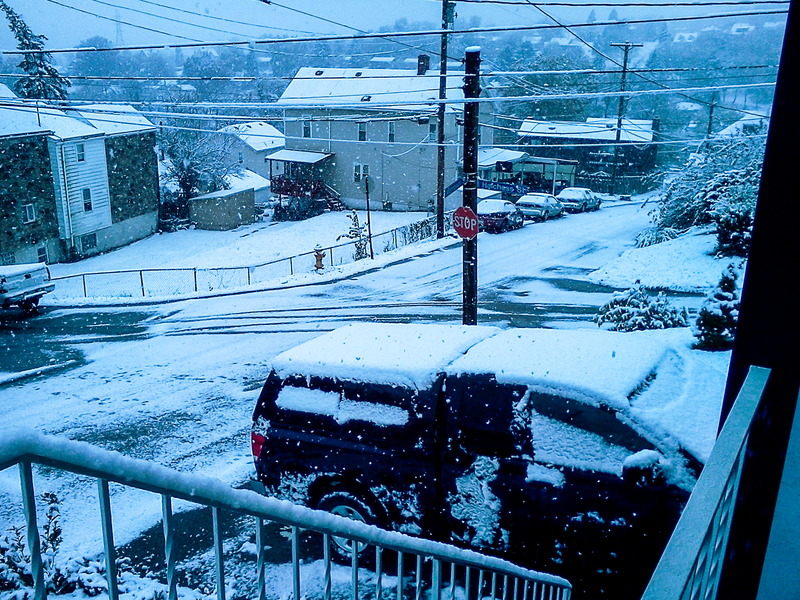 An early snow in the ‘Burgh. A couple things became evident about living in Pittsburgh: (1) the roads are often slick and (2) there are a lot of hilly places. The slick roads had a lot to do with the common temperatures in the cold parts of the year, which vacillated right around freezing, meaning that things would thaw out during the day only to re-freeze at night. The combination of snow, slick roads, and hills meant that the Prius wasn’t a very reliable commuter for four months out of the year. This became abundantly clear the one night in 2011 when, after it had started snowing in the afternoon, I was attempting to turn left and go up the hill into my neighborhood. About halfway up, the wheels spun a little bit, then something triggered in the Prius’s brain, and it stopped trying. Press the gas, nothing happens, wheels were too special to even spin. Anyway, during winters in Pittsburgh, the Prius stayed in the garage and the Titan was go-to every day. 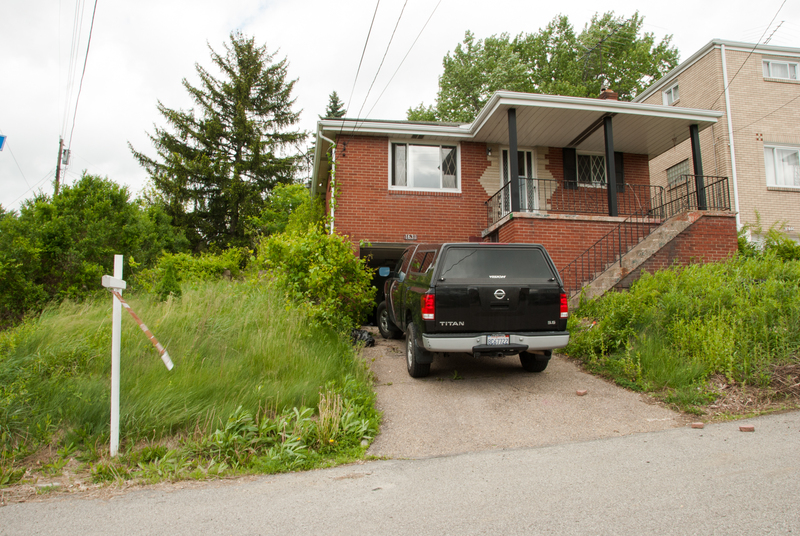 Aside from the basement, the house by 2012 was fully livable. Still stuff to do, but: livable. Landscaping was moving along slowly, but some of the plants that had been there pre-move-in came alive once the jungle was tamed. The big outdoor project of the year, though, was building the retaining wall on the corner of the property. This required us to go to the landscaping place across the street from the GetGo on Lebanon Road (as if anyone knows road names in Pittsburgh) and have them load up the Titan one one-ton palette at a time. 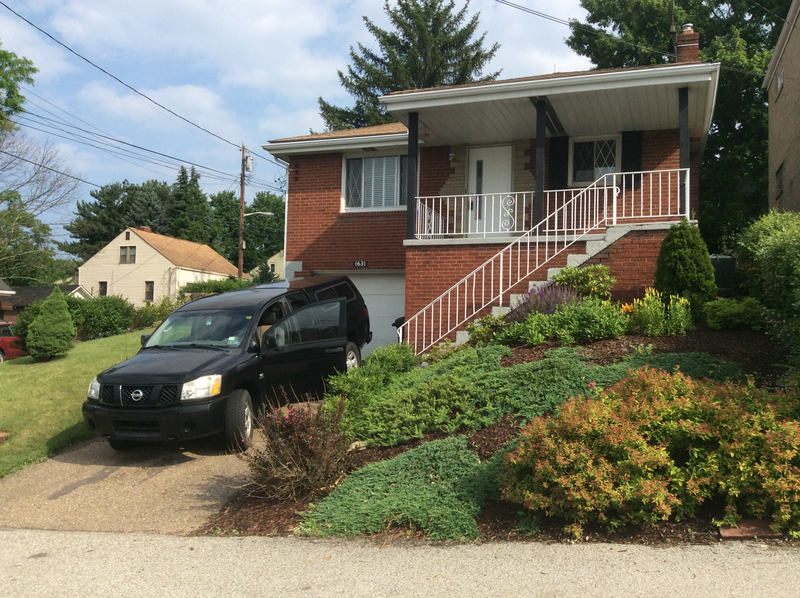 Front yard planted, foundation painted (as was the driveway…). 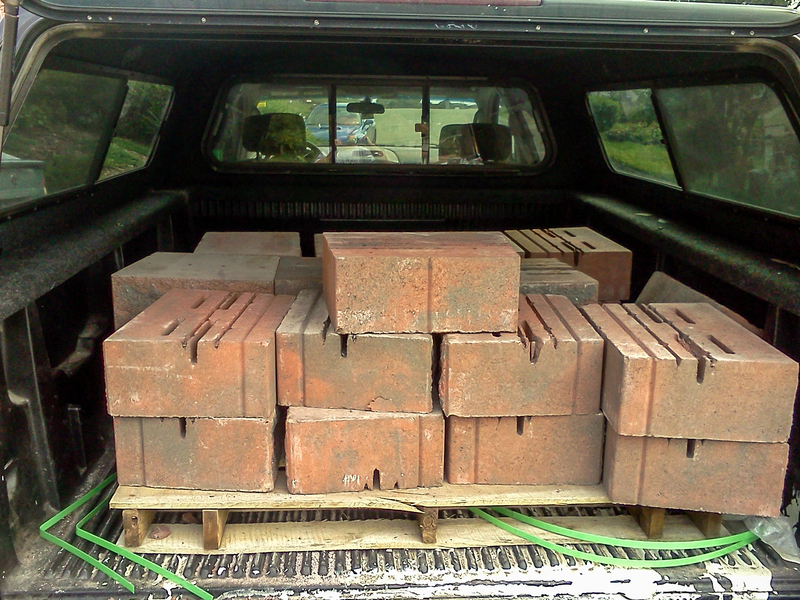 The bottom half of a ton of bricks. 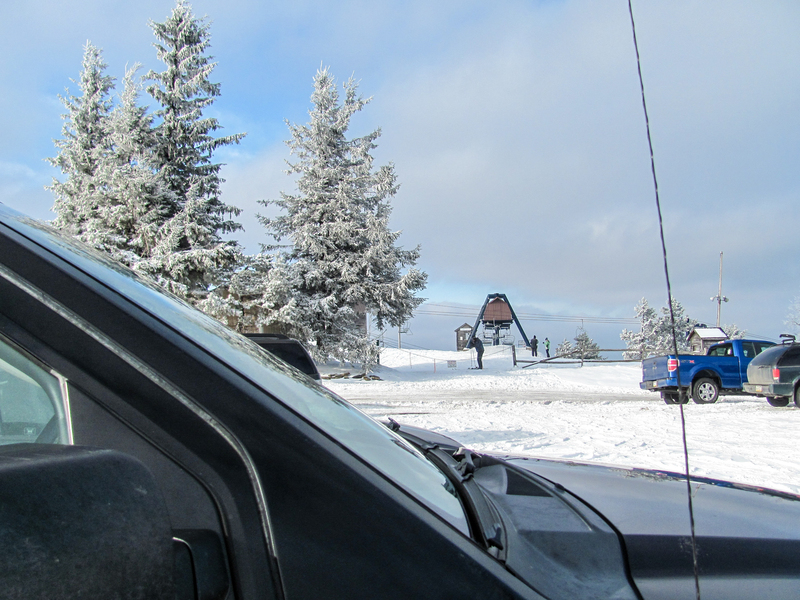 In 2012, we also discovered Blue Knob, the greatest ski resort in the history of Pennsylvania and one of the most endearingly western-PA sites on earth. At Blue Knob the lodge and parking lot are at the top of the hill (which made for some anti-climactic final chairlift rides up). The road to the resort was a little dodgy, making the truck de rigeur for the outing. The lot at Blue Knob. I’m sure we did some things in 2013. The basement? The basement was mostly 2013, so we probably bought the window bricks to put where the superfluous and non-functional a/c unit was. Bought and hung and probably transported a bunch of ceiling tiles. And… worked on my dissertation? Early on in 2014, I had a couple of fly-out interviews for jobs at Iowa State and Oklahoma. Got offers from both, accepted the one to OU. It was moving time again. 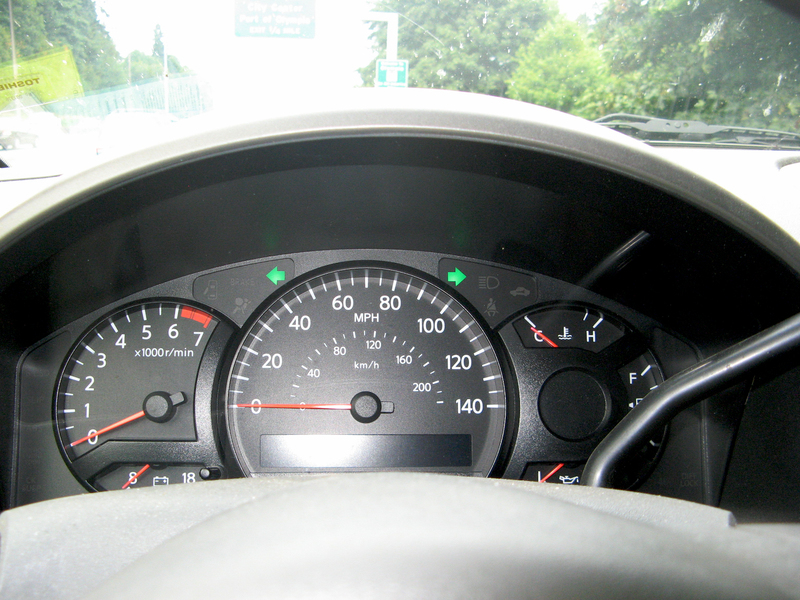 The Prius was a pretty good car for what it was; once it got up to speed, it was pretty responsive and communicative. Still, when I knew I was leaving Pittsburgh and would only need one car going forward, it wasn’t hard to decide against the Prius. The new employer footed the bill for the move, so the Titan and I were mostly off the hook for that one. Then the house sold almost immediately, meaning that as of the beginning of June I had nowhere to live. So: one last, great, almost-summerlong road trip together. The day (very nearly the moment) we left Pittsburgh. Those junipers look better than I remembered. There were a lot of things that needed done that summer. First, we headed down to Oklahoma to figure out where I was going to live. We went by the most scenic, non-toll route possible: across the top of West Virginia, across the south of Ohio, then into verdant hills of western Kentucky. Cut down through the windy roads of Arkansas, then took I-40 west till Sooner Road. Three days later, I’d made an offer on a house and we were back on the road. We kept things as Okie as possible, heading west through the Oklahoma panhandle through Boise City and Black Rock Mesa, the highest point in all of Oklahoma. From there, we headed up through Colorado (Pike’s Peak, Rocky Mountain National Park) and up to Utah for my niece Caitlin’s wedding. 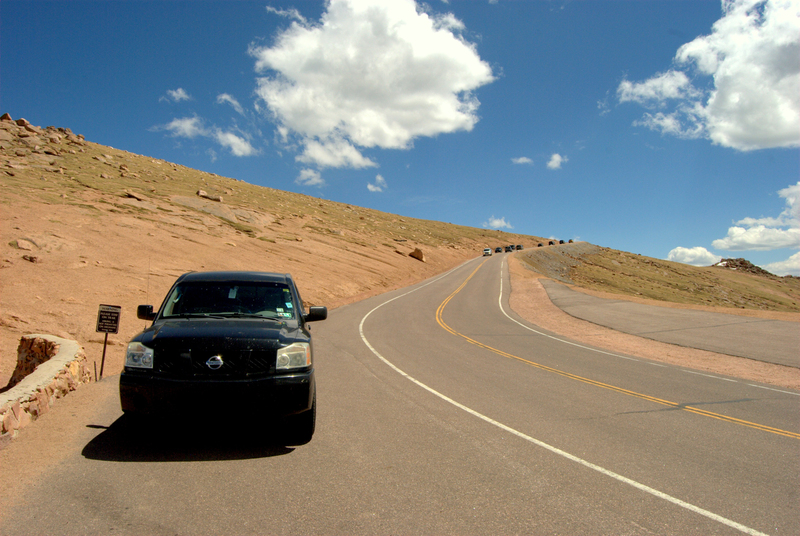 Once attended, we headed back down the 15 toward San Diego by way of Cedar Breaks National Monument. Was pretty worn out by Vegas, but, given that I was still three months away from a paycheck, didn’t want to pay for a hotel, so crashed at the rest stop just across the California state line. I had the cot in back so, apart from some idiot with a car alarm that went off once an hour, everything was a-okay. 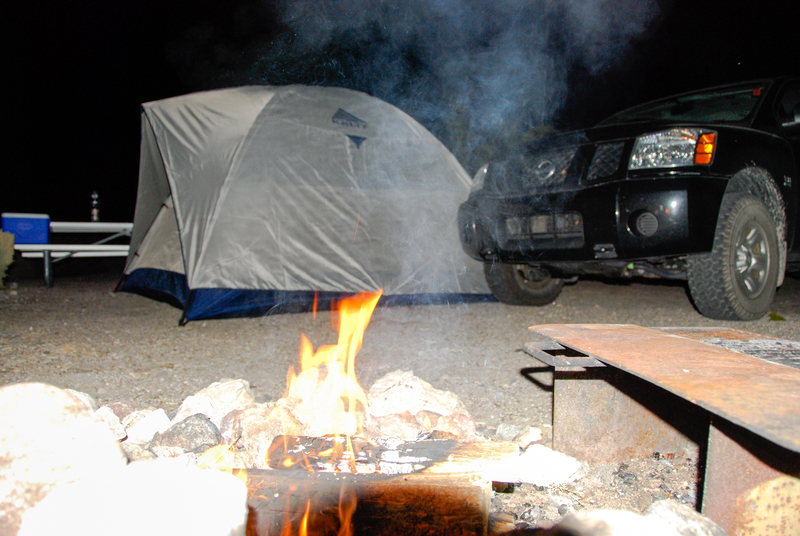 The Black Rock Mesa campground. Good clouds. Through southern Colorado, wedding-wear at the ready. Coming down from Pike’s Peak. We passed the brake temperature inspection. On the way into San Diego, during rush hour in the 909 near San Bernardino (the kind of rush hour where it’s bumper-to-bumper and everyone’s going 75), I heard a metallic scraping sound. I thought maybe it was something on the radio, but it persisted in a way that was not quite rhythmic. I turned the radio off. The sound continued and seemed to be close by, like under the truck. Then it stopped. I looked up in the mirror and saw that my tailpipe had completely detached itself and taken up a new residence in the #2 lane on the 15. There was too much traffic to stop and pull over. There was a cop there, but he pulled over some other truck immediately after the tailpipe drop. The car right behind me had seen what was happening and had given me a lot of room. The new exhaust system sounds better and gets a little better mileage. Post-San Diego, we made our way back up the eastern Sierras, where I was somehow sick to my stomach for about four days (not about the tailpipe). Lava Beds National Monument was more interesting than I expected, Mt. Bachelor was beautiful, the ice cave in southern Washington was cold, and eventually we were back in Tacoma. Lake Tahoe, 4th of July weekend. The traffic on the roads was even worse. Two legs left. Drove to the Beartooths first. Then there was a family reunion in Jackson Hole. Drove there from Montana. The Beartooths nearer to Yellowstone are more crowded. Post-reunion, my nephews Jacob and Sam got on-board. We headed to Mt. Rushmore and South Dakota during Rally Week (it’s amazing to see motorcycle riders trying to take up two lanes). Headed south through Wyoming into Colorado to visit Great Sand Dunes National Park. 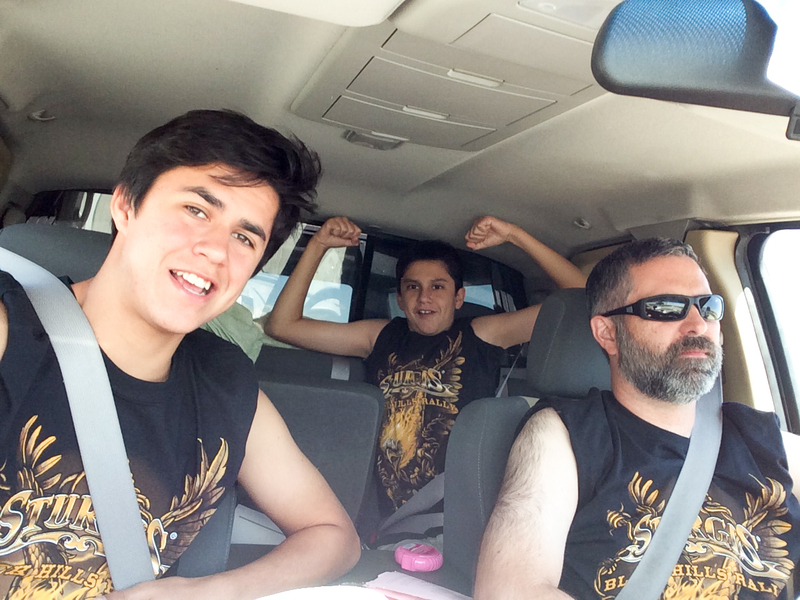 Cruised down through New Mexico to Carlsbad Caverns, saw some bats and a really big cave, then went to Las Cruces to hand the kids back over to their rightful owners. Trying to emulate our Rally Week heroes. Then we turned east and headed for our new home in the Sooner State. Commuting ensued, but so too did more landscaping, as the brand new house didn’t come with a whole lot of that at the outset. 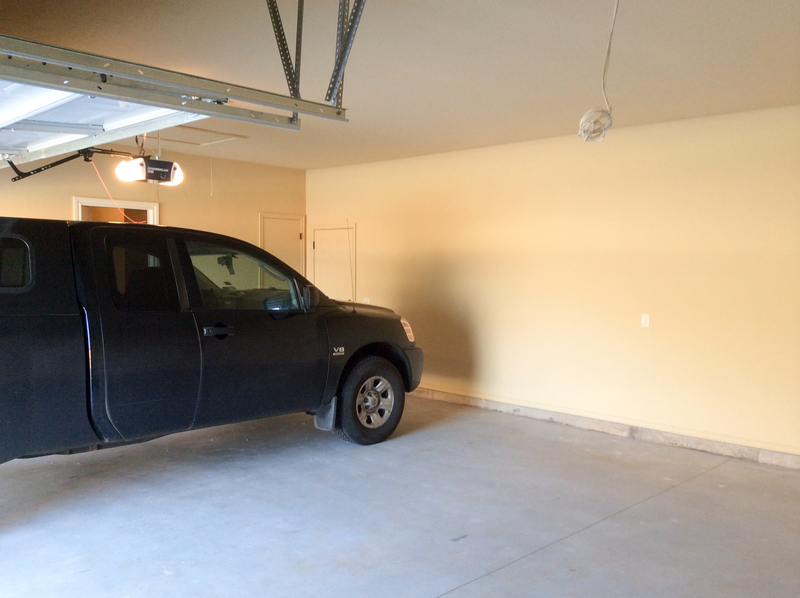 Finally, a garage big enough for the Titan. First time since Utah. In 2015, bought another car. 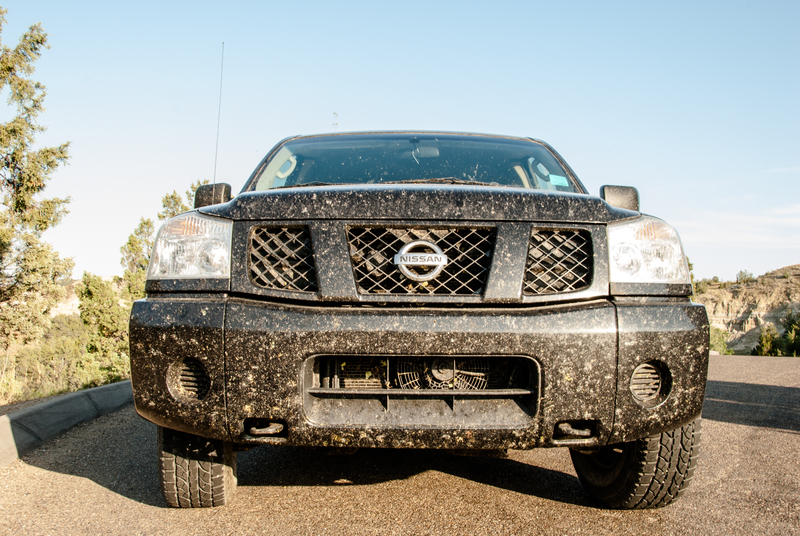 It turned out to be a little too special to be a daily driver, so the Titan persevered. The truck had acquired an issue with its center bezel, where a big hole had opened up one time when I tried some percussive maintenance to resolve a rattling problem. So I got to mess with a lot of plastic. More commuting, no road trips. A simple life. Not much vehicular adventure. And that brought us into the present year. In February, I found the perfect Jeep Wrangler:a year-old and 1,500 miles, right color, right trim and transmission, right price. Bought it. It was about time for the Titan and me to move different ways forward. But not before one last, real, need-a-truck-for-that job. Put the ad on Craigslist. Got an awful lot of interest. The photo that launched a thousand text messages. And that brought us to today. 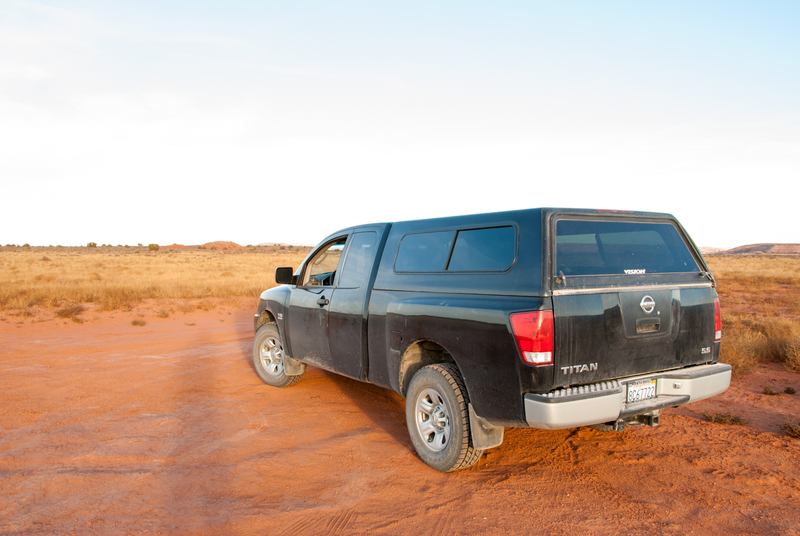 The Titan was, on the evidence presented above, the right vehicle to have bought at the time and to have had for the last 12 years. Not sure there’s a better compliment available to an inanimate object. Good driving and a long, new life, old friend. It’s gone to a better place. No, really — the 19-year-old who bought it is into fixing things, detailing vehicles, and off-roading. The truck really made out in this deal.